If you are unable to find the answer to your question below, please contact us directly. + What is the “lifetime” of the product? 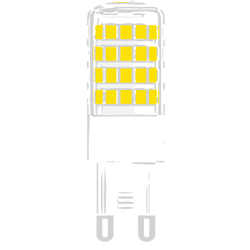 LEDs typically do not “burn out” or fail. Instead, they experience ‘lumen depreciation’, wherein the brightness of the LED dims slowly over time. Unlike incandescent bulbs, LED “lifetime” is established on a prediction of when the light output decreases by 30 percent. Along these lines, EmeryAllen’s chip bulbs are estimated to reach the threshold of 30% lumen depreciation at 25,000 hours. + What is lumen depreciation? There are two things that affect LED bulbs - heat and voltage. Published ratings of LED bulbs are referring to tests done on the chips in a lab scenario - i.e. stabilized voltage, open air (not inside a fixture), and unpackaged. In the real world, every time a light is switched on and off, the electronics and chips experience a spike in voltage. And, typically the bulb is inside a fixture, which increases the heat it experiences. + Why does the lifetime vary between filament and chip bulbs? Because of the way they are constructed, Filament bulbs have a shorter lifespan than chip bulbs. Without a heat sink, they heat up and fail much earlier than a standard LED that is better thermally controlled. EmeryAllen’s filament bulbs are estimated to reach the threshold of 30% lumen depreciation at 15,000 hours. + What is the expected lifetime of EmeryAllen’s LED transformer? The same factors that negatively affect LEDs, will negatively affect transformers. Putting them in a hot atmosphere or poor voltage regulation are the two main culprits. If installed and used properly, EmeryAllen’s transformers are expected to last for up to 40,000 hours.